If you are looking for a way to make your driveway, patio, walkway, or other outdoor space really stand out, you should consider working with Scanner Roofing & General Contractor to build a new surface using pavers. We work with pavers made from a variety of materials, including brick, concrete, and more. Pavers are available in a wide variety of designs and are perhaps the single best way to create an eye-catching outdoor space that will stand the test of time and look great for years to come. 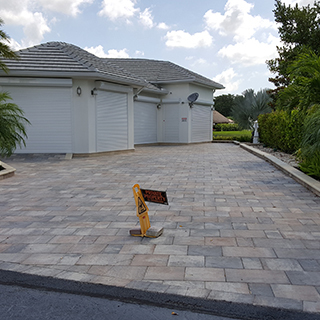 Here at Scanner Roofing & General Contractor, we have years of experience working with pavers to improve the aesthetics of properties all over South East Florida and the surrounding area. We believe that pavers are an ideal medium for adding beauty to any outdoor area, as they give any project a touch of that old world, cobblestone charm. •Versatility: Pavers come in a huge variety of shapes, sizes, colors, and textures. With so many options available, it’s easy to find a way to create exactly the effect you’re looking for and to create a truly one-of-a-kind patio, walkway, driveway, or whatever other surface you’re working on. •Low maintenance and high durability: Unlike some other building materials, pavers require almost no maintenance. Simply sweep them clean from time to time or rinse them with a garden hose. Because they are separate paving stones, they stand up to damage better than a single concrete slab and if one paver does get damaged, you can simply replace that paver instead of tearing up the whole surface. Additionally, they are weather resistant, which can be a very important factor here in South East Florida. For expert South East Florida paver design and installation, give Scanner Roofing & General Contractor a call.